began as I did twenty years later by recognizing that Freud developed his theories of psychiatry based in large part on his work with many severely disturbed patients in an effort to find ways to help them get past their personal traumas, and that Behaviorism, later called Experimentalism, was founded under the banner of science but was based on a manipulative study of rats in a laboratory and how to get the fastest and most consistence response with the least food pellets for reward. I will leave it to the reader which of the latest in modern academics owes a debt to the latter approach and which to the former. In any event, stated this way it must be clear to most educators that a new psychological underpinning will be needed when addressing a class of students who are quite diverse in their cultural and family backgrounds, their interests and desires, and previous school experiences. Surely we will need to adopt a much more positive approach to human development, one which honors individual differences but lays out ways to encourage, support and nurture each. Maslow called his approach Humanistic Psychology and sought to address how individuals can grow as beings in a healthy and positive way. Teaching at Brandeis University and the New School for Social Research (among others) Maslow’s thoughts gradually developed. I think he was influenced by his academic studies of biographies mostly of famous, dimensional men, unusually high level University students and perhaps by his critics as well. Maslow’s third level is social — belonging to, identifying with, feeling connected to, and being loved by. In many ways this is a broad category as one can be a yankee fan, a folk singer, a tweeter, but it intends to include intimate friends, boyfriends and girlfriends when things are going well. (When a student journal highlighted this reference: Harry and Janet Forever I would often reply “Forever is a feeling, not a time.” It was designed to soften the blow, later on.) One’s life did not end with the diverse of young love. With luck it was a broadening experience. While one relationship could be replaced by another, identification might provide a more stable reassurance. Sometimes being part of a school can do that. As can church or a sports team. The next up on the chart is self-esteem and accomplishments. It also includes being recognized for them. Would artists such as Van Gogh and Rimbaud have little self esteem? Surely not. But without recognition by others this may gall and leave confident esteem difficult to maintain. Finally, at the height of this climb, is Self-actualization, that is, achieving one’s full potential with creative arts, and dimensional, full, active life. I am not clear if a self-actualized person is necessarily honored for that. Under ordinary circumstances it seems to me that this dimension can threaten other persons by its difference. But the idea of aiming for this in oneself is stunning. At the alternative school this was a critical focus. No two beings would seek it in the same way. No one was expected to be there yet. But the deep goal of self-acceptance and accomplishment in one’s chosen pursuits seemed on target. We lauded accomplishment but didn’t restrict what paths could be pursued. 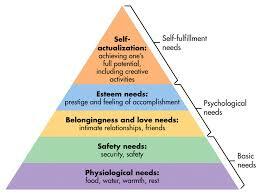 In later writings Maslow extended his hierarchy, suggesting that transcendence was yet another step. He added religion in its larger sense, perhaps influenced by Jung. I’d like to think he was reaching for the well being of the planet, and for the larger societal figures who transcended their time, their brief time in many cases. Abraham, Martin and John for example. Gandi, Einstein, Tesla? The idea I think acknowledges a later time in one’s life when activities are no longer about the self. Thank you Abe. These days I garden. There is so much to learn. To breathe more deeply. To make my peace with the world..